Billion Dollar Agent – Coaching for top agents. We would love to talk to you about growing your business faster. Business Plans, Systems and Guidance to focus your unique talents on increased profitability. We coach small business entrepreneurs with $100,000 to $10M in revenue per year. We have conducted interviews with over 1,000 agents and completed over $1,000,000 worth of customer-driven research in the past decade. We have over 1,000 pages of solid systems that we use to help you run your business. We have had over 1,000 30-minute phone call sessions with top real estate agents doing over $100,000 in GCI. We are not biased by one geographic area, association, franchise or system – we are both independent and global. Register for free coaching, books and other exclusive offers. The best system in the industry for managing time and realizing your Perfect Day. Live coaching with Steve Kantor, creator of the Billion Dollar Agent System. 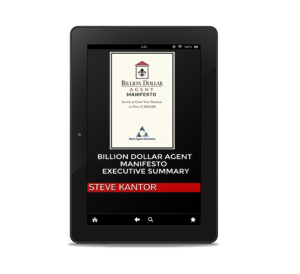 Steve Kantor, President of Billion Dollar Agent, has authored and published over a dozen books on the subjects of business, economics, technology and life lessons. A complete list of all publications is available on our Books page. 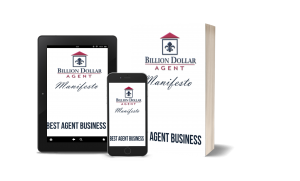 Get a FREE special edition ebook Executive Summary edition of Billion Dollar Agent - Manifesto when you schedule your first coaching session with Steve Kantor, President of Billion Dollar Agent. 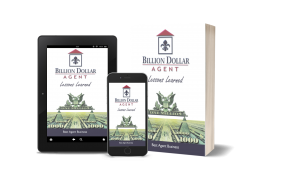 Billion Dollar Agent - Lessons Learned is based on interviews with real estate agents who have achieved $1 billion in career sales of residential real estate or are on track to achieve that level of success. Includes interviews with top national coaches/trainers such as Howard Brinton, Mike Ferry, Ken Goodfellow, Walter Sanford, and Floyd Wickman. 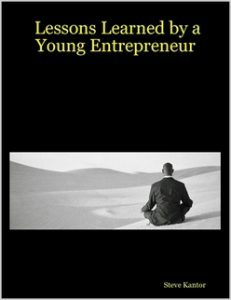 In 2006 I wrote this book for myself of Lessons Learned from my 20 years in business. From 1986 to 2004, I grew Gnossos Software with $1,000 invested from 0 clients to about 200 clients and from $0 revenue to over $2,000,000 at the peak. But it took me 18 years to achieve what should have taken about 5 years. Get to know Billion Dollar Agent and Steve Kantor. Our FREE informal coaching videos will introduce you to simple effective strategies and systems for Billion Dollar Agents. A full collection of videos is available on our Billion Dollar Agent Videos page. We would love to talk to you. Grow your business faster.